Spain's top flight must close the financial gap on the Premier League to stop it becoming "the NBA of football", says La Liga president Javier Tebas. 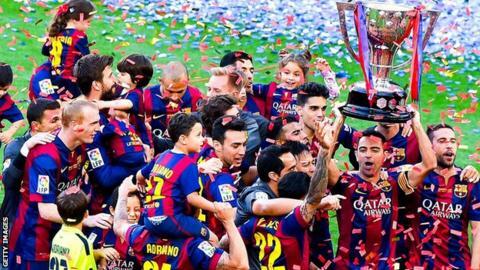 In the 2013-14 season the Premier League generated income of £3.26bn, compared to £1.51bn for La Liga. "We hope to grow so the Premier League does not become the biggest competition in the world and we can be at the same level economically," said Tebas. "We do not want the Premier League as a leader one step ahead of the rest." The United States' NBA is widely considered to be the leading global basketball competition and attracts the best players from the across the world. Tebas, a 53-year-old lawyer, told BBC Sport: "If we fail to do this [compete economically], the Premier League could become the NBA of football and that would not be good not for us, not for the sport. "We plan to work harder in the TV rights market and in the sponsorship market to get more money." Tebas believes Spain's economic problems in recent years have helped La Liga teams become better at spotting talent and getting value for money for players than their English counterparts. "The economic crisis made the clubs here utilise their capital better in selecting players," he said. "When you have less you have to work to find cheaper talent in the market. In this Spanish football has done pretty well. "Barcelona and Real Madrid, but also other clubs like Sevilla, Valencia and Villarreal, took advantage of this market. "The crisis taught Spanish football to work harder to find talent, whereas the Premier League had it easier and didn't have to work as hard for this." Tebas pointed to the Premier League's financial clout as a reason why the division attracts the world's top coaches and could compete for some of La Liga's premier playing talent. "The Premier League can pay the managers more money than they can get in La Liga," he said. "The best players are already in the Spanish league, but the risk is there, and it is a challenge that we have." However, Tebas said Leicester City's remarkable title challenge this season proves that the richest clubs do not always succeed. "It is magnificent. It is literally a miracle what Leicester are doing and that they will qualify for the Champion's League," he said. "That demonstrates that football is not all about the money, and that is a very positive thing."